Tennessee football and the NFL lost a great running back and scout in Reggie Cobb. He ushered in the Volunteers most successful period of the modern era. The Tigers have an intriguing visitor on campus this weekend. Happy Good Friday. Whether you’re at work or have the day off, there’s no better way to waste your afternoon than pouring over every meaningful Auburn headline. I left bacon in the oven too long while writing this, so help me honor my gone-too-soon breakfast sandwich by reading this article. Enjoy. – ESPN released its preseason college Football Power Index. What do you think about Auburn’s ranking? – Auburn’s path to the national championship certainly won’t be easy, but we’ve seen a field of blue bloods on the schedule before. I wonder if the Football team can learn anything from Basketball? – Speaking of Football, catch up with Gus Malzahn now that Spring practice has ended. – We have a bit more clarity on the QB battle, but nothing definitive. Who would you like to see start as Auburn’s signal caller? – You may have missed these other position battles while focused on the quarterbacks. – See whose stock increased this Spring on both the offensive side and defensive side. – Take a look behind the scenes of Football throughout this season. – If you want to avoid anger on this Good Friday, don’t read this AL.com article lumping Bruce in with other, actually corrupt, coaches. – In lighter news, there’s been a slight change in Basketball’s schedule next year. – Bruce is really starting to recruit at Auburn, see how next year’s class could fit in. – Baseball has struggled lately, but isn’t giving up hope. That hope showed with a big SEC win against Ole Miss. – See full highlights of the game one victory here. – In other Baseball news, see which former pitcher is hanging around to finish a degree. – Softball mercy-ruled another opponent, see the highlights here. – Gymnastics was eliminated from the team competition, but see which individual is still competing. 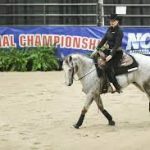 – Equestrian news! The reigning champions are through to the finals to defend their title. Here’s the path they took to get there. – There are still event competitions going on today. Here are the brackets for Equitation Over Fences, Equitation On The Flat, Horsemanship, and Reining. Auburn football, baseball, equestrian and softball are the featured topics in Friday’s edition of Tiger Tidbits from Inside the Auburn Tigers. Yesterday we took a look at the performance of the Auburn offense during A-Day. Today, we’ll review how the defense performed. While Auburn’s offensive play calling may have been vanilla, the defense was even more limited, by design. No, Gus didn’t call any real trick plays, but when Auburn’s offense needed it, he dialed up some important play calls. The defense, however, was ordered to play only base package without any blitzes. And the story of the day was Auburn’s passing attack. However, the caveat of the offense’s success was the defense was not allowed to blitz or disguise coverages, which exposed Auburn’s secondary and severely limited the defensive line. Regardless, Auburn’s defense played exceptionally well, especially at the starting front. It’s no secret that returning Nick Coe, Marlon Davidson, and Derrick Brown makes Auburn an automatic contender. In my opinion, these guys made Auburn’s run game even more suspect than I already thought it might be. Despite having to play extra cautiously, these three were dominant when they needed to be. The SEC Network crew made a statement that “Brown and Co. dominated when they needed,” and they did just that. Elsewhere on defense, there were some missed tackles, but none that I thought were made by guys that Auburn will actually rely upon. If you just looked at the highlights and the stats, the secondary seemed to be torched all game. Fact is, Auburn’s receivers made some fantastic catches in terrific coverage. Two of those touchdown tosses, specifically Malik Willis to Mathew Hill and the big leaping Seth Williams TD should both have been interceptions. Auburn’s DB’s were in position in all but one touchdown, and the Nix-to-Stove TD was the only real open TD on the day. However, even that one was a direct result of the defense’s inability to call and execute a real game plan in the red zone. In my opinion, just having the secondary be in position on those long throws, with the lack of a pass rush, shows me that it is going to be just fine. Furthermore, Gus did show some wrinkles on offense, specifically his patented wheel route. This has been a play that is almost impossible to defend when it is set up properly. Kam Martin has been fantastic running it the past two years, and while he appeared to get open (as the announcers were quick to say), Auburn’s coverage rolled properly and would have been in position to make a pick-six if the ball had been thrown. There was only one bust in coverage; I can’t recall who the receivers were, but the Auburn defense rolled the safety to the top receiver, leaving the seam relatively open. However, Joey Gatewood made the wrong read and threw into double coverage. This likely could have been done by pre-snap disguise to make Gatewood check to the outside. It was difficult to see just how good Auburn’s defense is really going to be, though. Most believe the real struggle will be at linebacker where Auburn took the biggest hit following last season. There is no doubt that Deshaun Davis will be missed immensely. In his place will be K. J. Britt, who has patiently learned from Davis while waiting for his moment. Britt easily has the biggest shoes to fill. But A-Day didn’t allow him, or really any defensive player, to showcase their ability. However, as we noted, tackles weren’t missed, and overages were good. Most importantly, the run game was stuffed, which is what Auburn has to do to win the SEC West. The Auburn defense is going to be fine, but the question is: Can it be as good as it has been in previous years? The post Zach’s Thoughts on A-Day: The Defense appeared first on Track 'Em Tigers, Auburn's oldest and most read independent blog. By Matthew Barnes, Sports Commentary. When the month of March rolls around, college basketball fans across the nation rejoice in the madness that ensues. A look at some of the defensive players that improved their stock in the spring. Finding and reading people’s thoughts and opinions on Auburn’s A-Day isn’t hard. Whether it is beat reporters, professional analysts, Twitter users, or just your favorite sports blogger, the information is plentiful and easy to find. I am sure the message boards and pay-wall sites are filled to capacity with everyone’s thoughts, especially on the hot topic, for which everyone seems to have a hot take. It would have been a lot easier to muddle through if coach Malzahn had offered real thoughts on the spring game or in the practices leading up to A-Day. Spring games are often watered down, both in substance and also time, as the second half features a running clock. Yet, this spring seemed odd because the lack of real substance started at the beginning. 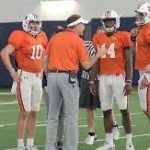 Coach Malzahn is notably tight-lipped about everything, and this year his tin-foil hat was tightly pulled down over his visor after scrimmages. In past years, reporters have had to work hard to coax out information about big plays and performances during scrimmages. What the coach has to say is important to fans, who know that these small glimpses into the program were likely the best source of information to be had. 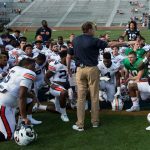 Coach Malzahn continues to take every precaution to make sure that opposing teams don’t get any glimpses, and if that means that passionate Auburn fans are left speculating wildly after Auburn’s glorified scrimmage, so be it. There were some things to take away from Auburn’s spring game other than simply the quarterback battle that will rage on through the summer. Here are some of my thoughts about Saturday’s A-Day game. Auburn’s defense played well against the run, and while it would be easy to point to some long quarterback keepers that were whistled dead, it is important to remember that the game plan was designed to ignore the QB run and the RPO. What mattered was between the tackles, and Auburn’s defense forced more cracks in the Auburn run game than a lot of people thought were possible. As it was last year, you can largely ignore the stats put up by D. J. Williams, just as you could last year when walk-on C. J. Tolbert was the MVP. If you wanted to see how Auburn’s run game was really doing, you just needed to watch when Boobee Whitlow and Kam Martin were in the game. They looked just as they did last season: not SEC-caliber, every down backs. While this has never been Martin’s calling, Whitlow was essentially forced into the role last season. The issue is that he took the job by default. Auburn didn’t have a rusher eclipse the 1,000 yard mark in a season for the first time in a long time. Some of that was caused by the offensive line struggles. Some of it was relying on Jarrett Stidham throwing the ball. Some of it was Whitlow’s injuries. However, most of the reason was Auburn’s not recruiting SEC-quality running backs or keeping them on campus. Auburn’s offensive line did not push the pile against a very talented first and second string defensive line, and a lot of that was due to play calling on both sides. It probably helped the offensive line that the defense couldn’t blitz on passing downs, but it was hard to create running lanes against a talented group of defenders that simply “stayed home” against the run. While it remains to be seen if Auburn’s run game is actually in trouble, technically speaking the offensive line did look better than at any point last season. The receivers, despite missing huge pieces in Will Hastings and Anthony Schwartz, did more than “just catch the ball,” which is something they have struggled with under coach Kodi Burns. Under Burns and Malzahn, Auburn’s receivers have been pure talent more than polished players. For the first time, Auburn’s receivers made contested catches without any bonehead drops. Perhaps most importantly, Auburn’s John Samuel Shenker looks like a true inline tight end. Last, but certainly not least, is the quarterback battle. You can take Cord Sandberg out of the equation. Unless this is a fine job of slow-playing a quarterback, Sandberg wasn’t given any opportunity to separate himself, despite being nearly flawless in his lone appearance against Purdue and again on A-Day. The fact is he never played with Auburn’s first group and was given zero chance to shine in the passing game. Malik Willis likely lost the job last season when he didn’t show any growth as a player in the 2018 spring game. Fair or not, Willis has had an uphill battle ever since. He was robbed of any chance to showcase himself during games and essentially had to press the issue in this spring game to be noticed. While Gatewood and Bo Nix were given great play calls and the best players, Willis was not. As a result you could see him forcing plays while Gatewood and Nix seemed effortless in their execution. Yet, Willis DID make plays despite not being given the same opportunity. It appears the coaching staff has moved on from Willis. Could we be surprised? Absolutely. I hope that’s the case. Doesn’t seem like it, however. The real battle appears to be down to Gatewood and Nix. However, there are some small nuances that make me believe that Bo Nix is going to end up being Auburn’s starter come November. Yes, Gatewood is physically gifted. The Cam Newton comparisons are everywhere, but pump the brakes on that, ye of short memory. Jeremy Johnson had those comparisons. So did Woody Barrett. So did Jason Smith. Despite what you believe, the fact remains that Auburn’s offenses since Nick Marshall have been best with NON-Cam Newton-esq players like Sean White and Jarrett Stidham. Bo Nix shares a similar play style with them. The most important thing I learned on A-Day came from listening to the on-camera comments and watching the play calls Gus Malzahn made on the field. The lone bit of trickeration that Malzahn attempted all game was attempting to draw the defense offsides to set up a free play. Gus even called who the pass would go to: Williams up top. He later commented on this on camera, and it was executed perfectly by Bo Nix. It ended in a 38-yard bomb down to the two-yard-line. Nix tossed two touchdowns after offensive pass interference was called, robbing Shenker of a TD. Nix was unfazed and tossed the ball for a touchdown to Stove on the next play. On that drive, Auburn’s offense looked unstoppable. Nix made some great reads on the option. He made some great throws. The most important takeaway was that he was on the same page as his coach and was trusted to make the play. That’s why I think Bo Nix ends up being the starter in November. Check back with us tomorrow when we’ll share our thoughts on the defense’s A-Day performance. The post Zach’s Thoughts on A-Day: The Offense appeared first on Track 'Em Tigers, Auburn's oldest and most read independent blog. The Auburn Tigers played host to the Washington Huskies this past season, beating the Pac-12 foe for one of their top wins of the non-conference season. The golf course isn’t the only place where we might see some breakthrough Tiger performances this year. Which of the SEC’s Tigers could be king of the jungle? Starting with football: *One of the young players who got our attention in spring practice is Richard Jibunor, who will be a sophomore buck this year. At the mid point of the baseball season, the Auburn Tigers sit at a crossroad. Four weeks ago, Auburn was 18–2 after a fast start to the season. After falling to No. 16 Georgia Tech, 11-6, Tuesday night at Russ Chandler Stadium, the Tigers have now lost 11 of the last 15 and sit at 24–13. To be sure losing starter Davis Daniel and Jack Owen, has been one of the major reasons for the slide. Anytime a team loses two of their three starting pitchers, it’s got to hurt. And it has really affected this team. Auburn used six pitchers in its loss to Tech. The six hurlers allowed 13 hits, walked 10 batters and threw three wild pitches. However, there have also been struggles at the plate during the free fall. With runners in scoring position Tuesday the Tigers were only 4-23 (.174). In addition, Auburn has been held to two runs or less in six of their 15 SEC games. That’s the bad news. The good news is Auburn’s 8-7 in conference play and only two games out of first place. And after playing three of the first five SEC series on the road, the Tigers can look forward to hosting three of the next five at home. Perhaps even better news are reports out of Auburn that south paw Jack Owen (3-0 and 0.31 ERA) may be able to pitch out of the bullpen when the Tigers play No. 17 Ole Miss this weekend. He’s been unavailable since leaving the line up due to tendinitis in his throwing shoulder. If Owen returns to form and Auburn gets Davis Daniel back to 100 percent, it still has a chance to make a postseason run. Again at the start of the second half of the season, the Tigers are sitting at a crossroad. Will they get both starters back? Will the bats come alive? Will they turn it around? Will they be able to make a case for the post season? The post Auburn Baseball Season at a Crossroads appeared first on Track 'Em Tigers, Auburn's oldest and most read independent blog. Rick Barnes and Phillip Fulmer speaking on the Tennessee Vols basketball program leads our Volunteers news for Wednesday, April 17, 2019. Alexis Johnson had a breakout senior year with the Tennessee Volunteers. Here is a look at his five best potential landing spots in the 2019 NFL Draft. Happy Tuesday. If you didn’t find a way to enjoy this past weekend, I don’t think you have a pulse. Gus’ offense looked AU Fast, Tiger put together one of the greatest comebacks in sports history, and Game of Thrones finally returned. Catch up on all of the Auburn news you might have missed while weeping over Tiger hugging his son and Jon riding the dragon named after his dad. – First, to that AU Fast offense. See who scored and how they did it here. If you’re into still shots, here are some good pictures of the game. – One particular WR made a fairly bold claim last week. He could be right given this redshirt freshman’s emergence and this junior’s return from injury. – Oh and by the way, neither of them were the Offensive MVP. Opposing DB’s may be in trouble this year. – The QB battle was the most obvious story. Could one QB be the next Cam Newton? At least one writer seems to like experience over upside. – If I had to pick a QB order, I would roughly agree with these rankings. – Here are some good takeaways for the game in general, as well as an analysis by one of the linebackers. – If you’re feeling brave, see projections of the depth chart on the offensive side and the defensive side of the ball. – The game must have been good because a dual-threat QB committed after. – Take a trip down memory lane with this alumni football game. Here’s a full list of participants. – Bruce Pearl finally got paid. Do you agree with the amount? – In other Basketball news, an Auburn big man played through a broken thumb in the Final Four. – Baseball had a shut out win against TAMU this weekend, but still dropped the series. Full highlights of the lone win here. – Softball won game one against USC in dramatic fashion, but fell in the last two games. See the dramatic finish here. – What a group of seniors: every member of Softball’s senior class was drafted into the National Pro Fastpitch. – Your undefeated and defending national champion Equestrian team is at it again. Get hyped for the national championship here. – Finally, #AgricultureSchool. Auburn was awarded a grant to study biofuel. Auburn beats 2 more bluebloods to reach the school’s 1st ever Final Four! Auburn football, baseball, softball and golf are the featured topics in Tuesday’s edition of Tiger Tidbits from Inside the Auburn Tigers. College Football Hall of Fame coach Pat Dye writes about the Auburn football team and his favorite golf tournament. The Auburn Tigers concluded spring practice on Saturaday with the annual A-Day Game that was highlighted by the quarterbacks. It was a Tale of 2 games as Auburn began their run to the Final Four. Auburn football, baseball and the No. 1 ranked equestrian team are the featured topics in Monday’s Tiger Tidbits from Inside the Auburn Tigers. Our 10 favorite moments from Auburn’s record-breaking season and run to the Final Four. Auburn sophomore Seth Williams is a playmaker for the Tigers. AUBURN, ALABAMA — Chayil Garnett raved about Auburn after his first visit there, which took place in late March. “My family loves the school. I love the school. War Eagle, everybody! It’s Auburn football game day once again! It’s A-Day on the Plains. This game will be televised on the SEC Network channel. The game starts at 3:00 PM Central Daylight Time. It’s a great opportunity for us Tiger fans to see what this year’s team looks like, and what they’ve learned during spring drills. For those attending the game, lots of sunblock is in order, today. There may be a few passing clouds and a stiff breeze, but there is little, if any chance for rain. Temps will mostly be in the low 80s, for this one. As always, feel free to participate in this thread. I’ll at my desk, typing my first A-Day play by play in about a decade, as I was unable to make the trip today. War Eagle, and enjoy the game! The post A Sunny, Warm A-Day! appeared first on Track 'Em Tigers, Auburn's oldest and most read independent blog. Texas A&M baseball (25-9-1, 7-4-1 SEC) is back at Blue Bell Park to welcome the Auburn Tigers in a big SEC west showdown. Auburn University’s best and most impressive NCAA basketball trophy doesn’t sit in a glass case. Starting with football: *A note about junior receiver Marquis McClain, who is featured in an article today, is he mentioned that he has been impressed with how. Auburn football, basketball, baseball and softball are the featured topics in Friday’s edition of Tiger Tidbits. Auburn conducts its annual A-Day scrimmage on April 13.